Following up on the theme posted in March 2012 this is the last guest post in this series from Erin Taylor on her research on 19th century sperm whaling in the Phoenix Islands. Early American whaling efforts targeted whales found directly off the New England coast. 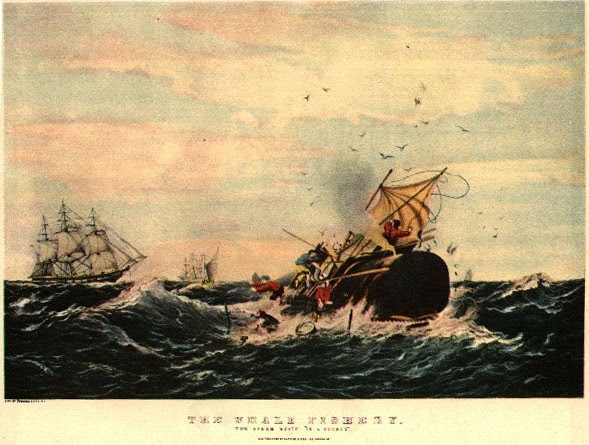 However, advances in technology, rising whale oil prices, and an increasingly depleted New England fishery pushed whalers beyond Atlantic waters and into the Pacific during the mid- to late-18th century and beyond. Whalers reached the central Pacific Ocean and Hawaii by the 1820’s. This timeline is reflected in our own historic whaling research, with the first American whaling vessels arriving in the Phoenix Islands region by 1825. In our last post, we shared one of our research maps analyzing how vessel and whale movements looked when broken down by month. Below, check out another way to slice the data: by years, starting at the very beginning in 1825. In the initial period of activity (1825–1833), whalers mostly sailed right along the equator, hardly venturing beyond 2 degrees S latitude. Activity was sparse, and in nine years, only five voyages ventured through the PIPA region, taking a total of nine sperm whales. By the next period (1834–1842), word of these promising sperm whaling grounds had spread, and activity boomed, with the number of voyages increasing almost sevenfold. Sperm whale strikes were even more dramatic—between these two periods, the number of sperm whales killed increased by a factor of sixteen. The Phoenix Islands lived up to the promise of fertile whaling grounds. The whaling industry in the central Pacific subsequently matured and was at its peak by the third period (1843–1851), which is evident by the many dots sprinkled on the map below. By this time, activity had spread even further south and throughout the Phoenix Islands than it had been in previous periods, with the number of voyages still doubling. 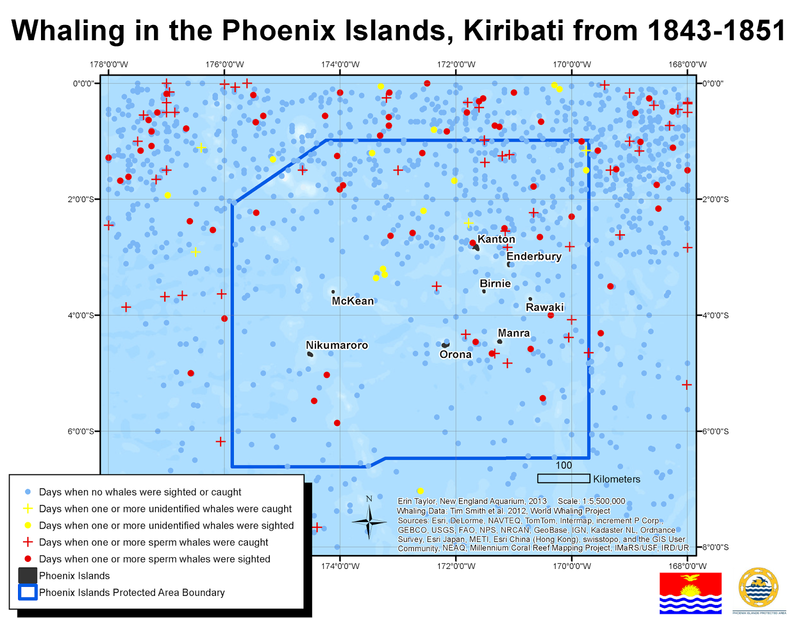 Snapshot of historic whaling in the Phoenix Islands Protected Area when broken down by time period; this map shows Time Period III (1843-1851), representing the age when American whaling in the central Pacific had matured and was at its peak. However, despite this ever-increasing effort, the number of sperm whales caught in the third period dropped by half. As has happened in so many other global fisheries throughout history and today, the whale fishery was showing signs of depletion. American whalers had hunted the sperm whale so vigorously over the previous decades that they were having a harder time efficiently harvesting a now-overexploited population. By the last period (1852–1874), when whale oil was becoming obsolete and the price of voyages was becoming too great for such little return, whaling in the Phoenix Islands and surrounding region rapidly dwindled, mirroring the fate of the sperm whales themselves. By 1874, the last American whaling vessels sailed out of the Phoenix Islands. When combined with future systematic surveys of whales currently in the Phoenix Islands, our maps and research on historic whale distributions will help PIPA managers develop a better understanding of the best conservation strategies to use to protect both the sperm whales of PIPA and the ecosystems they depend on.